Brave WW1 soldiers from Blackburn with Darwen who died in the conflict could be honoured with a new memorial – with your help. Two local men are appealing for community help in their bid to build a larger monument in Corporation Park which lists the names of more than 3,000 men and women who fell in the Great War. 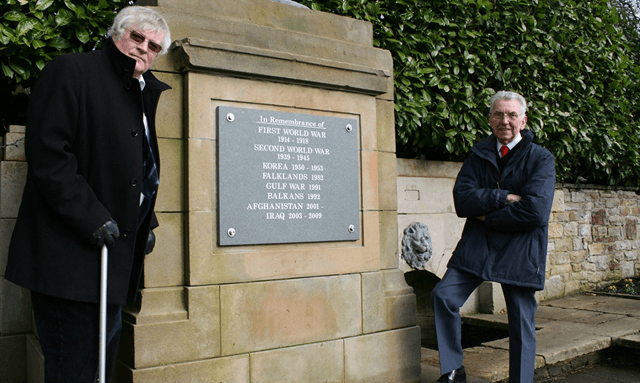 George Hardman, who is Blackburn born and bred, and Melrose Dyack, from Whalley, have launched a bid to create a bigger plaque in Corporation Park to list the fallen. This will be added on to the existing remembrance garden and memorial which currently lists only the conflicts in which people from the borough have died. George and Melrose put forward the plans this year as a way to commemorate the centenary of the start of WW1, and are appealing for the public to help them in their attempt to name the war heroes. Mr Hardman said: “I was doing my family tree and I found that my mother’s brother, my uncle, had been killed in World War One. I came to look at the memorial at Corporation Park and I was amazed to see there were no names there. I went to the library to ask where a full memorial was and was told that the borough did not have one. Cllr Hollern said of the planned memorial: “It is extremely important that we remember those brave men and women who made such huge sacrifices for our Country. Our borough cannot let the sacrifice many of our families made during this dark period in history be forgotten. “These plans are very much in the spirit of 1914, and I hope people can come together and volunteer to help make their community a better place. To help the campaign to construct the memorial please contact Jacques McCaughran on (01254) 585448.